I arrived earlier than normal, at around 9:30. But still not early enough to beat David. David was already setting up to start welding the ash pan. Gilbert and Bruce arrived shortly afterwards, and a little later we were joined by Mike. It was a beautiful sunny day, a little chilly, but still the sort of day when it's a pleasure to be outside. 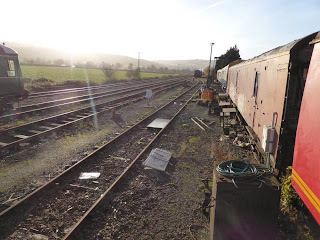 Which is fortunate because 2807 is over the pit in front of the David Page shed. For the first few hours we were all involved in work on the ash pan, but also periodically distracted by a yard shunt that was going on. The crane that has been next to the TPO for some years is no longer there. 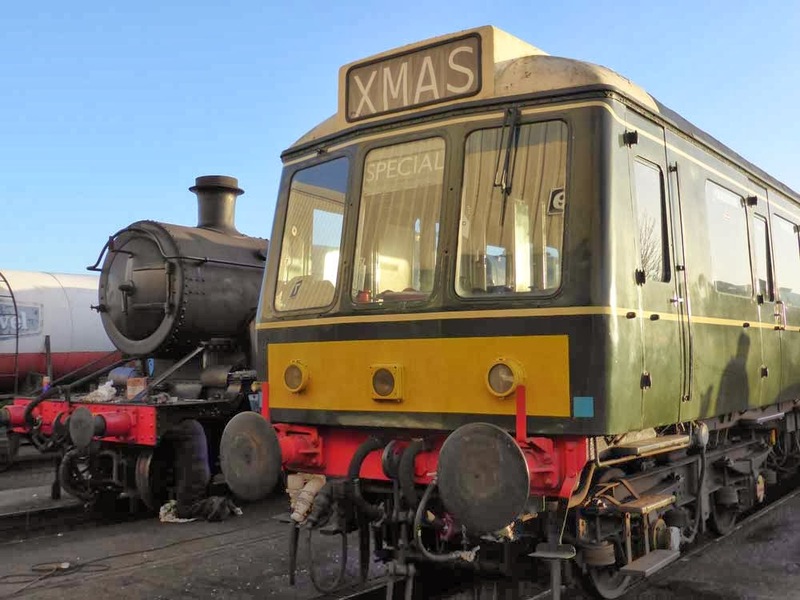 It has been replaced by the Cotswold Diesel (owners of the 45 and 26) coach. Of course, while the crane required no specific access, we have become accustomed to storing our 'stuff' (mainly rail chairs awaiting processing into boot scrapers) against it. This changes now because the diesel guys will need access to their coach, and so some of the chairs had to be moved, with possibly more to be moved at a later date. In addition to this our water supply is shared with the diesel guys' coach, and so this had to be changed as well. It seems that some of the reason for the move around is to make space for the arrival of un-restored 28XX no. 2874. Apparently she will be taking up residence just about in the position that 2807 occupied for so many years. That's going to be a bit odd for those of us who were involved at that time. If we give them a blue plastic bag to put on the chimney, which was a 'feature' of 2807 for many years, then it will feel very weird. Anyway, back to Saturday,Gilbert checked the loco roster and discovered that 2807 is due to be in service on Saturday 7th and Sunday 8th. This added an element of urgency to proceedings! Bruce was preparing the ash pan plate for the front of the rear section - the plate that the damper door is attached to. Mike and I turned our attention to completing the reinstatement of the valve cylinder front ends. The RHS was pretty much there. We'd fitted the front cover and rod cover a few weeks ago (16th). Since then the LHS has been measured and rectified, and the front covers loosely fitted. Mike and I fitted the RHS front cladding and insulation. 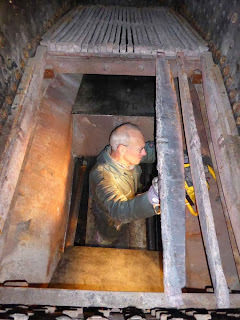 A tricky job in the confined space available. Then we tightened the LHS front covers. This brought us to lunch time. After lunch, unfortunately Mike had to leave, as he'd been in early in his role as loco cleaner. So I fitted the LHS cladding and insulation. 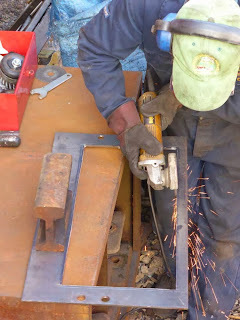 Then Bruce and I fitted the running plates, flap, and lamp bracket - two man jobs because of the round-headed bolts. David and Gilbert continued with the ash pan work. The rear plate was welded in and then the base lowered back into position. 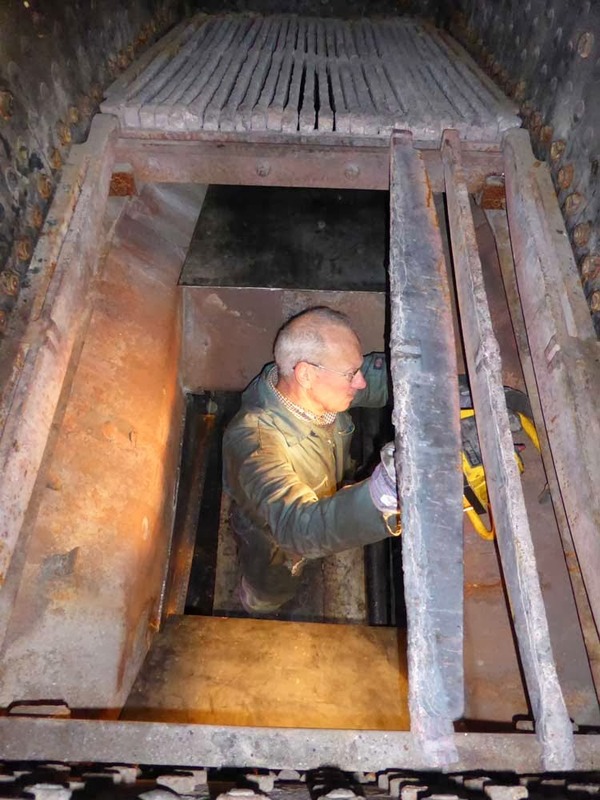 It had been lifted to the front part of the firebox, as it was felt if we removed it completely then it might not be possible to get it back in again with the back in place. The floor was welded across the back edge, securing it to the back section. It now remains to weld the sides of the base, then weld the door plate in position and reinstate the door and operating lever. 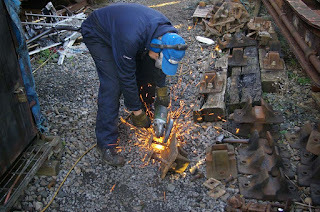 David will be coming on Wednesday to complete the welding for the loco to be in service on Saturday. The air extraction system, purchased by us on behalf of the railway proved very effective. And finally - Christmas is coming!